BGO Bingo is arrived on the online bingo scene in September 2012 replacing XBingo. All players who are registered at XBingo will be redirected to BGO Bingo with the same login and account details. Enjoy an enormous selection of Free Bingo and a wide variety of games across BGO network. BGO Bingo a full service platform of online gaming and is definitely a one stop destination for all your gambling needs. You won’t find an artistic, flashy displayed homepage, instead a site that gets straight to the point focusing on all divisions that are offered. To really appreciate all the details of BGO Bingo players need to register to explore the massive network. The site is well suited for the bingo player who is looking for more than Bingo and wishes to engage in a venue of online gaming that covers all gaming options. Proprietary software makes all the difference when playing Bingo because it offers its own unique blend of bingo products. IGT and Bwin software provide the platform for Slots. BGO Bingo is fully licensed and regulated by the Isle of Man Gambling Supervision Commission and is owned by Mandalay Gaming Holdings Ltd. Registering is painless requiring no credit card information and allows players to cross over to every division with one account. Because BGO is such a massive network it is difficult to ignore all the venues. Divisions include Casino, Sports, Lotto and Vegas with an incredible line up of Slots. Bingo variations include 75 ball and 90 ball bingo. Your attention will be quickly drawn in with the incredible list of Free Bingo rooms. Play Bingo for Free and win real cash prizes, funded player or not you can stay, play and win. The 75 ball and 90 ball rooms offer £1 to £15 prize pools. The Super Jackpots Bingo is the newest addition added with varied cash prize up for grabs, lined up for every day of the week. Ticket prices vary from 5p to 10p with prizes up to £1,000 given away. Other Jackpot Bingo games start at a mere 1p for the budgeted minded player. Head over to Slots and you are pleasantly surprised with some of the biggest names in the online gaming industry with Monopoly – You’re in the Money, Monopoly – Here & Now, The 100,000 Pyramid, Big Foot, Super Hoot Loot and more. You are invited to play bingo games Free with No Deposit Bonus compliments of the house after registering an account. Make your first deposit and more Free Bonus cash is yours. The Deposit Bonus varies depending on the size of your deposit so make it worth your while. Exclusive promotions are refreshed on a weekly basis with oodles of exciting offers to choose from including Jackpot games, prizes, Tournaments and more. The VIP Platinum Club puts you in a class of respect that is rightfully deserved for your loyalty. The rewards are amazing and once you are a part of this Club the ladder to fantastic offers get better all the time including champagne and lobster dinner in honor of reaching the Platinum level which is by special invitation only. BGO crosses the boundaries of Bingo and goes beyond what players seek in an online Bingo site. Starting with every type of gaming you could possibly imagine and Free Games that blow the competition out of the bingo water. We rate BGO Bingo with 3.5 Pink Hearts. A really great site with a lot of variety. 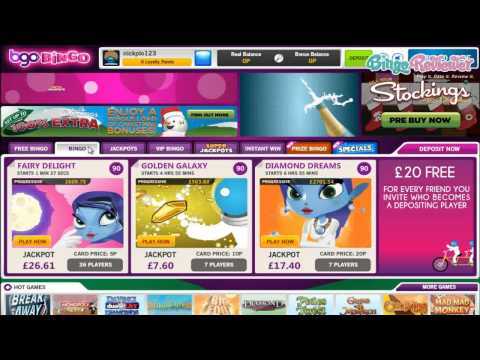 Their prices are fair and their minimum deposit is only £10 which is almost unheard of for an online gaming site! They offer over 10 Bingo rooms with tons of opportunities to play for free on a daily basis and you can also try for your chance to win big with any of their evening Super Jackpots which I often find myself doing. Every day, they offer a total of nine, yes that’s right, nine free bingo rooms available for you to play in. It’s hard to go wrong when you play here. Only three of the nine rooms are dedicated to VIP members, but the rest are available to everyone and anyone every single day and you can even buy tickets for as low as 1p! I also really like their loyalty program. It’s unique and refreshing when you’re constantly seeing sites with all the same things over and over. It’s called the Platinum Club and it has containing Blue, Bronze, Silver, Gold and Platinum statuses. The prizes are awesome and range from loyalty points to access to special promotions to champagne and a lobster dinner! I think a lot of people will be-going to BGO bingo because it's high quality and full of tons of entertainment for the enlightened bingo player. The proprietary software allows them to really cater to their own customers needs while making sure the site stays secure along with all of your information. What I don't like is that they pretty much stick strickly to UK players so I can't play here and try out their cool and unique games. Those of you lucky enough to make the cut will find a wide variety of bingo and slots for your pleasure. Placing a high emphasis on entertainment, you will find all the help you need from the support and chat staff as well as in the extensive online self-help that is available. Be sure to check out all the new rules and regulations to ensure a smooth withdrawal process when you win at this site! Don't forget to avail yourself of promotions and prizes and the loyalty program. You will have a lot of fun at BGO bingo and I hope you have great luck as well. This is an impressive site that has a lot to offer, and not only bingo games. This is probably one of the sites with the best free bingo offer that I have seen so far. On the other hand, they cover only 75 ball and 90 ball bingo, which is not bad if you like the classics, but could be just a bit richer with the new and popular fast paced bingo games. Anyway, they offer a 200% sign up bonus, which is not at all bad, but I still miss a no deposit bonus that I always use to explore the site and games. The addition that I like is the mobile version of the site, so you can access it from your phone or tablet, perfect for those who like to play on the go. They have a lot of active promotions, so you better take your time to read them all. They have tons to offer here! In fact, it is one of my favorite sites to play at. They offer a decent welcome offer and their gaming selection is insane! They have so much to choose from. They’ve got the classic bingo games, casino games, slots, sports and even private gaming available. Another thing I like about playing here is the amount of promotions they have available! There is a first deposit bonus upon sign up, plus plenty of other promos to look forward to during the rest of your gaming experience. They do plenty of holiday promos as well as regular promos that you can take advantage of at any time. One of my favorites is the bgo booster in which you can play each night to see if you bingo within the maximum ball limit and if you do, you win the progressive jackpot. Keep an eye on the promotions page for the latest promotions! BGO Bingo better than Xbingo? 18+. New customers only. Use code BINGO. £20 in Bingo Bonus for first deposit of £10. Available for purchasing Bingo tickets only. 3-day expiry on the Bingo Bonus. 4x wagering on Bonus. Bonus can’t be withdrawn. £10 min deposit + 2.5% fee (min 50p). Not available using Neteller or Skrill. Cash balance withdrawable anytime + £2.50 fee. Full Terms apply.